Good day to all participants and activists of the forum! 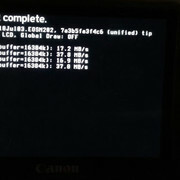 I am new to using the Magic Lantern firmware, but before I created this topic I spent a lot of time searching for the information I needed, but I ran into a problem I can't solve without your help. Before the test, I formatted the card on my PC under the exFAT file system, then copied the ML firmware files to the card, reflash the camera, and then made a benchmark. The benchmark data, by the way, correspond to the information that the mlv_rec.mo module displays. When I try to set the resolution parameters, etc., while recording RAW, focusing on the theoretical card bandwidth (up to 40 MB / s), the recording ends after the first few frames. Tell me please, what am I doing wrong? Most M users here run Sandisk Extreme Pro which is not showing the dreaded "Shutter Bug". The only thing you did wrong is getting a card not able to keep up with specs (as otherwhere reported, too). Can't exclude faked card either. And that's not bad because refunding should be easy. There are Sandisk Extreme Pro cards of 300mbs read speeds and very high write speeds as well as cards that are 95mbs Extreme Pro. Not sure which to buy. 5DC, 5D2, 5D3, EOS M, too many lenses. Performance of those 300 MB/s cards (UHS-II interface) is inferior to 95 MB/s cards (UHS-I). When used in cams with UHS-I interface ... and your M doesn't have UHS-II. Got it. What about the 170 mbs Extreme Pro cards? 170 MByte/s is for read only and the only devices known today to use Sandisk's proprietary overclocking mode are Sandisk's newest cardreaders. Running there write rate is indeed higher, too. But with other devices they are only a tad slower compared to 95 MB/s and we don't know if older controllers (used in your M) are able to get unlocked.